A new life for my silk band. 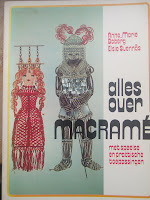 This book is the extended version of Renate Kroos' phd tesis on German medieval embroidery (more specifically, from Niedersachsen) from 1958. This is one of my favourites. 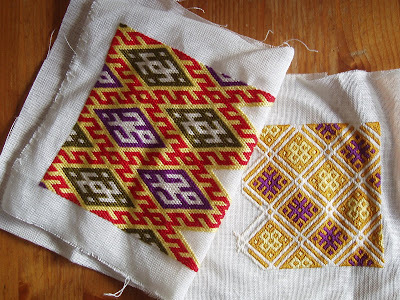 The combination of different stitches and materials is fascinating. The crown of the lady saint (I don't know who) is done in gold thread, the rest of the embroidery in white liuen and coloured silks. He just posted some nice embroidery pictures! It's in the Utrecht University Library, and copies are also available via amazon or abebooks. Young describes the socio-historical context, compares the wallhanging with other contemporary works, explains its iconography and even gives some technical details. I've only had a quick glance at the paper, so I can't give specific details yet. 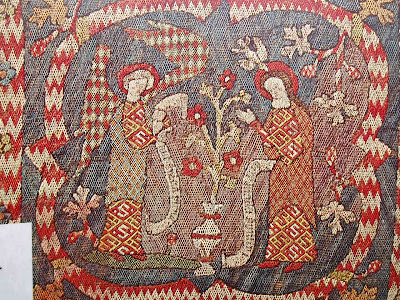 A detail that suprised me, is that the faces and other details are actually painted on the embroidery! I think that's funny! I finally finished the tablet-weaving project I started last January. It has been sitting in my living room for almost a year, totally neglected and barely touched, until I decided it was time to change this sad situation last Wednesday. The band is about 1.50 m long and 1 cm wide. It is made using 64 threads, 16 hand cut cardboard cards and 1200 Denier DeVere Yarns silk. I tied the threads between to fixed points attached to the ends of the windowpane. 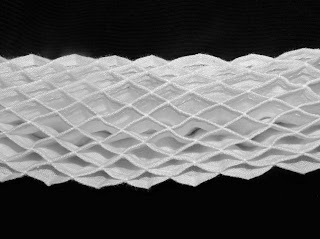 I learned that regular tension and using a beater are very important to end up with a pretty and evenly woven band. Also I didn't like the cardboard cards, since after a while the corners of the cardboard squares split and your yarn gets tangled up with the cardboard. I'm also considering buying some kind of loom before starting my next project. With this band I'll make a pair of garters to match my medieval outfit. 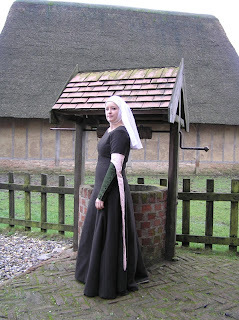 I still have to find some nice 14th century replica buckles to go with them. Still need to finish a small piece that needs to be sewn closed with the decorative stitch, and make the fingerloop braids, and then ... it's done! Anyway, I wanted to show you this page, taken from the same book. Seventies books might be cheesy, but they are also packed with technical details that you don't find in modern books. 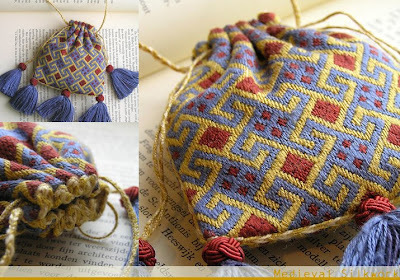 I think this book shows a technique that might have been used to make knots to embellish 14th century purses. 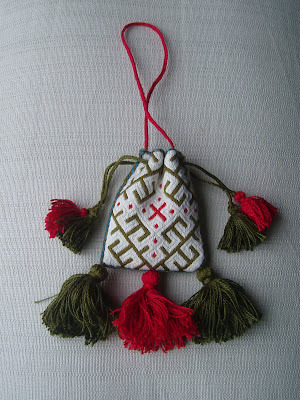 These knots were made with silk gimp or gold thread, using 4-8 paralel strands of thread and working over a core of e.g. wood. 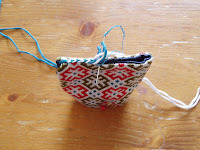 This is a tutorial for making "de knoop voor het keesje" ( I don't know why they call it like that :-). Click on the picture to enlarge. The pencil points at step 1 and I think the pictures don't need a translation. 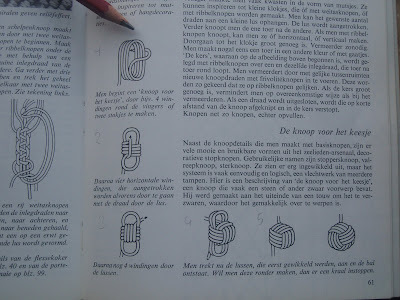 According to the Dutch text, you have to put some kind of "core" in the knot to mould it into shape. This really looks like the type of knots from the picture above. 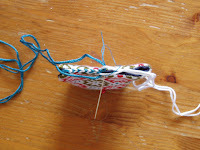 I think this technique works better for making knots with more than 3 parallel strands of thread than this technique, but I haven't tried it yet... My problem with the latter technique, when I try to use more than 3 threads, is that I can't keep the threads parallel and that they start to cross each other. I think this technique doesn't have that problem. The Feldbach tablecloth (click here and scroll down for a picture) amazes and puzzles me for a number of reasons. One of those is the complex yet funny embroidery design and how this could be transferred onto the linen fabric. 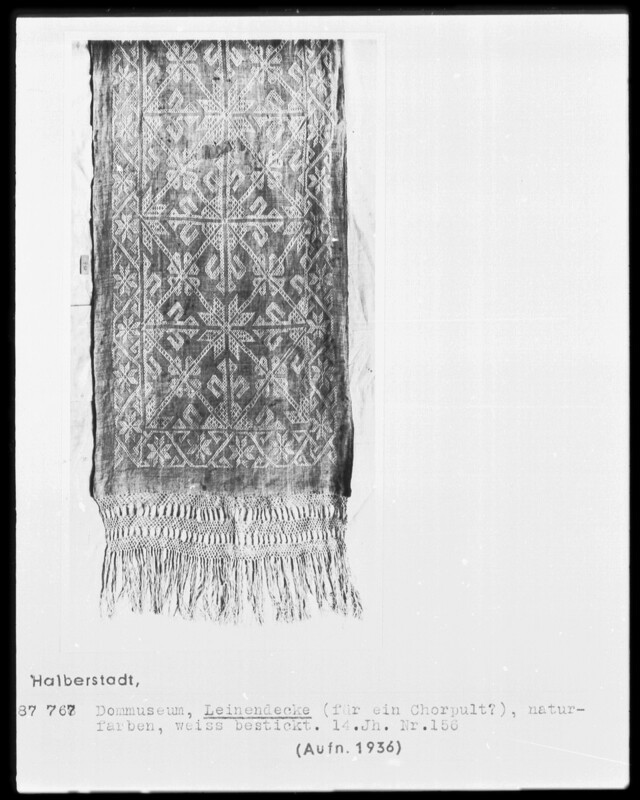 According to Schuette and Muller-Christensen (Das stickereiwerk, 1963, p. 19), the tablecloth itself was embroidered by either nuns, merchant's wives or wives of local city governors. The embroidery design was done by professional painters. And my big questions are: How did they do that and how am I going to repeat that? 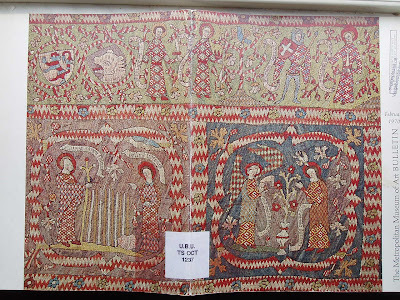 Cennino Cennini's book Il libro dell' arte is a late 14th century painters manual which describes how a painter can work an embroidery design onto the fabric. And he makes it sound so easy! These citations are taken from this website, which features the whole book. CLXII A Section Dealing with Work on Cloth: First, Painting and Gilding. 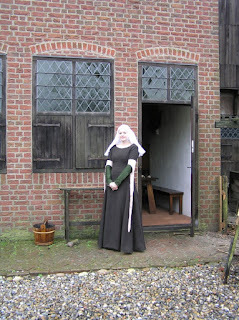 Now let us speak about how to work on cloth, that is, on linen or on silk. And you will adopt this method for cloth: in the first place, stretch it taut on a frame, and begin by nailing down the lines of the seems. Then go around and around with tacks, to get it stretched out evenly and systematically, so that it all has every thread perfectly arranged. 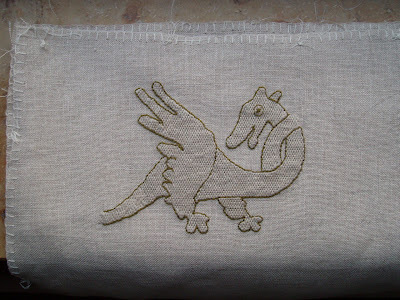 CLXIV How to Draw for Embroiderers. Again, you sometimes have to supply embroiderers with designs of various sorts. 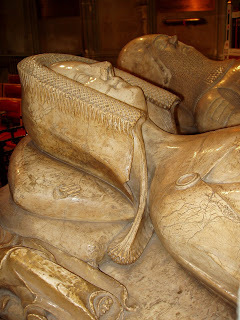 And, for this, get these masters to put cloth or fine silk on stretchers for you, good and taut. And if it is white cloth, take your regular charcoals, and draw whatever you please. Then take your pen and your pure ink, and reinforce it, just as you do on panel with a brush. Then sweep off your charcoal. Then take a sponge, well washed and squeezed out in water. Then rub the cloth with it, on the reverse, where it has not been drawn on; and go on working the sponge until the cloth is damp as far as the figure extends. Then take a small, rather blunt, minever brush; dip it in the ink; and after squeezing it out well you begin to shade with it in the darkest places, coming back and softening gradually. You will find that there will not be any cloth so coarse but that, by this method, you will get your shadows so soft that it will seem to you miraculous. 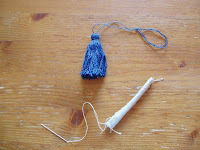 And if the cloth [p. 105] gets dry before you have finished shading, go back with the sponge and wet it again as usual. And let this suffice you for work on cloth. 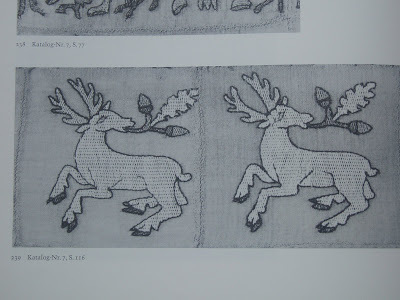 It's interesting to see the parallels between embroidery designs and book illuminations in the 14th century. 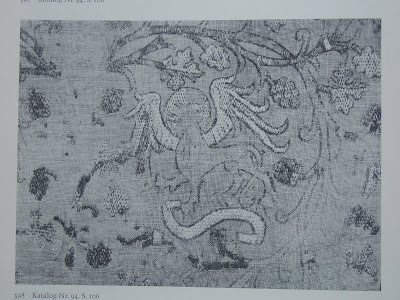 The intertwined dragons of the tablecloth have been compared to similar book illuminations. Anne Warner writes about that in this paper. The goat-like creatures with the long hornes are a bit like these creatures in a French manuscript (see also previous post). 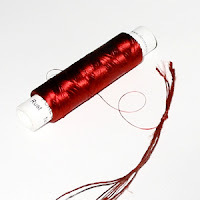 The only things you will need are: a pair of scissors, a reel of fine 120 denier floss (available at DevereYarns, see sidebar for a link to their website), regular silk ebmroidery yarn or linnen yarn to use as core threads, preferably in the same colour* as the 120 denier floss. AND: A LOT OF PATIENCE! 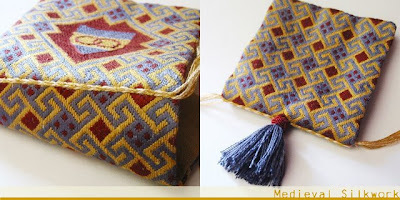 *I don't know wether they used coloured or white cores in medieval times, but the advantage of using the same coolour is that it doesn't really show if you forget to cover a little piece of the core with silk and also when you tie a Turk's Head Knot with it, often a bit of the core might become visible. this effect is reduced by using a core of a similar colour. 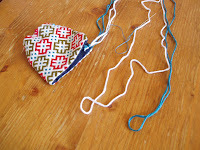 Cut several pieces of yarn of the same length. In this example I used a length of ca. 50 cm and cut five pieces of yarn. 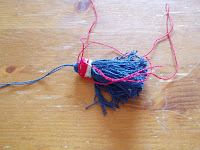 When you twist the yarns you will get an idea of the final thickness of your gimp, though the gimps tends to be a even a tiny bit finer because the threads will be compressed by wrapping the silk around. 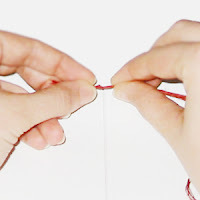 Tie the (five) yarns together with the silk thread in a small knot. 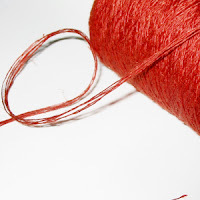 Take the two ends of the linnen yarn in your two hands, and put the reel of thread between your upper legs, or find another creative way to make sure the reel can't unroll. The yarns should form a nice T-shape. Make sure to keep the tension right. 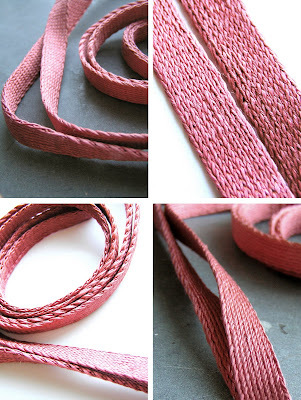 Now you can start winding. I did the winding in my direction, but you can also wind away from your body, whatever suits you best. 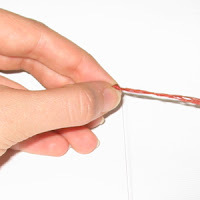 The advantage of this method is that you have both your hands available to control the winding, and to make sure you don't leave any spots of the core thread visible. After about an hour of winding and winding this should be your result. My gimp is about 1 mm in diameter. 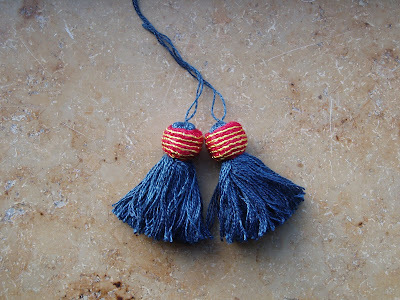 To make one Turk's Head Knot for a small sized tassel (ca. 5-7 cm long), you will need about 50 cm of gimp thread. The gimp in the picture is made by myself. It took me about 2 hours to create one metre of gimp. I hope to post a seperate tutorial for making gimp sometime soon. 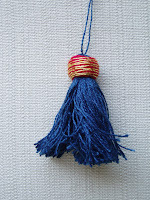 You will need just a regular tassel. Make a Turk's Head Knot. I always find this tutorial very easy to work with. 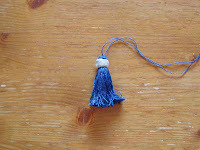 I just make the knot on my fingers like in the tutorial and adjust the size later when I put it on the tassel. 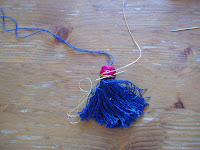 When the knot fits tighlty around the head of the tassel cut off the ends of the gimp, and pull inside. 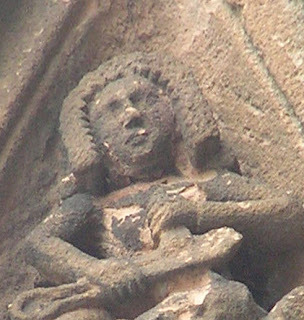 For online pictures, click here (insert LM 1825 a, LM 1825 b), here or here. 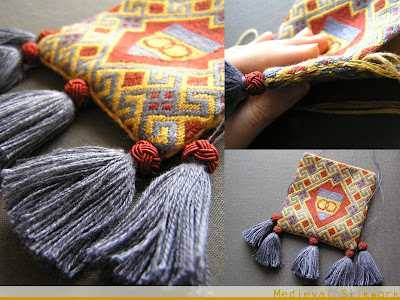 Wrap the gold thread around the tassel head and attachit with tiny silk stitches. 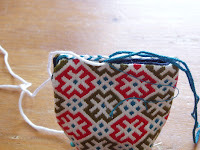 The outward seams of (embroidered) textile pouches can be finished in at least two ways. 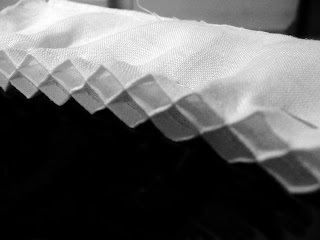 One method is to cover the seams by tablet weaving. 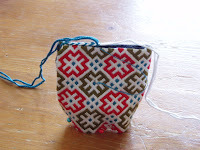 There are some examples of textile pouches finished with this technique in Dress accessories (Egan, G., Pritchard, F. (2002), Dress accessories. 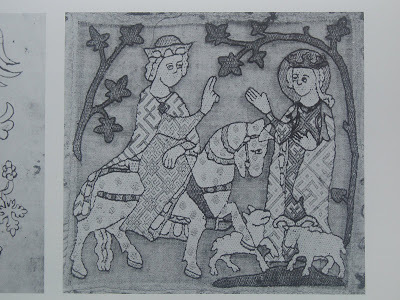 c.1150- c.1450, London: The Boydell Press). 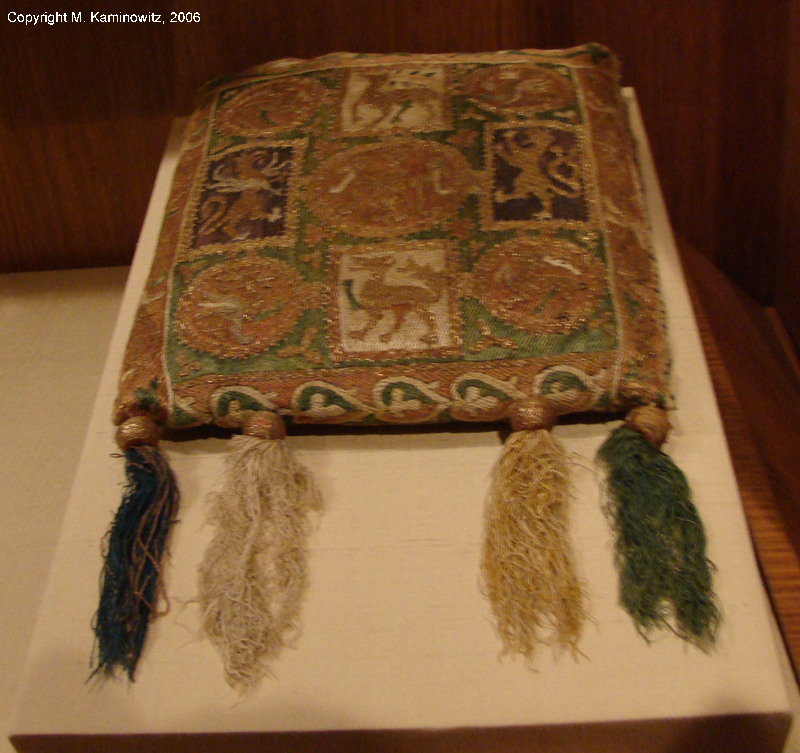 The side seams of the 14th century London textile pouches discussed in this book are covered with tablet weaving. Anyway, I hope I will be able to keep in touch every now and then! This is my first "sketch" for the Feldbach tablecloth. 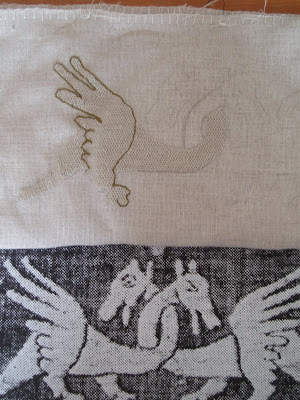 The creature on the right is outlined using stem stitch, and I think I like that better. 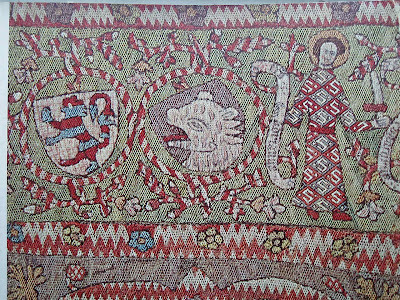 Below is a picture of this part of the tablecloth, from das Stickereiwerk. 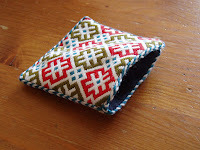 Next, I'm going to try the "rectangular" border below. 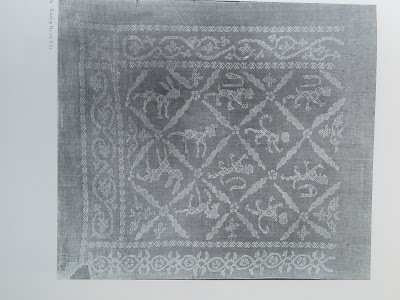 It is done in interlacing stitch/ orientalischer Flechtstich. 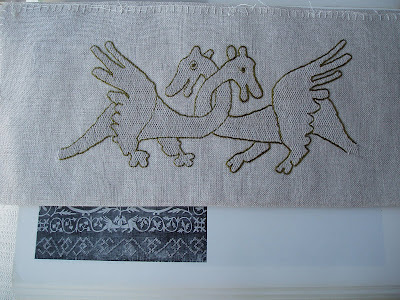 Help, it looks difficult :-) I found a picture of a 14th century German whitework wallhanging with the exact same border, so maybe this type of border was quite common. It looks nice, with the fringe and all! It is a blog authored by all members of Deventer Burgerscap where we will write about our projects and research, events, ... We will mainly write in Dutch, but some posts will also be in English. In the weekend of the 17th and 18th of February, 'die drei Holländer' (Bertus, Laurens and me) went to a 14th century reenactors meeting in Dorsten (Germany). More photo's of the weekend can be seen here. It was a lovely weekend, we met a lot of new people, the food was deliscious, the atmosphere was great. I have been very busy with my studies recently, so I didn't have time before to write a short piece on this. 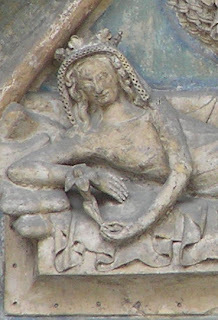 I'm in the middle of working at an excavation in Antwerp, and am writing several papers for university (on late medieval pottery) and some articles on medieval headwear.